Rain, rain, rain. What can I say. Is this because we had barely any snow this winter? It’s almost the end of May and I think I could count warm days on one hand. Such a rainy weekend, I didn’t see many around. Probably will be many more over the Memorial Day holiday, so I’ll have something to report. Hope you all get out to our Memorial Day parade on Monday, 10 a.m. in the Park. Rep. Tina Pickett will be our guest speaker and Mrs. Rhonda Stasiak will place the wreath at the monument. Enjoy all the parades in Sullivan County over the Holiday to honor those who have served and are now serving to keep us free. Let’s hope for warm, sunny weather. Miss Sophia, a friend of the Orthodox Monastery, Ellwood City, will be spending the summer at St. Nicholas House on Church St. She is from a small town in Texas, so should fit right in. If you see her out and about, welcome her to our community. She and Mother Galina came from the Monastery on Monday and Mother Christophora joined them on Wednesday. Mother G. and Mother C. will leave on Thursday to attend some events in NY and NJ. Adel Bradshaw, West Chester, spent a few days at her home on Church Street. The weather wasn’t the best, but she still enjoyed her time here. HINT: “Walnut: Buff Dings out of Wood Furniture. Get rid of unsightly scratches and dings on wood furniture by rubbing a walnut on the areas. The blemishes will vanish quickly and your furniture and pocket book will be saved. St. Vladimir’s Church has pierogies for sale. To order, please call 570-928-9238. Hope you all have a great Memorial Day Holiday. Be safe and enjoy. Won’t be much longer and school will be out. I’m sure the kids are looking forward to that. If you have time to spare over the weekend, take a ride up to the Bullis home on Dutch Mountain. They are having a yard sale on Friday, Saturday and Sunday, from 9 a.m. to 3 p.m. Might find something of interest. I’m sure there will be signs posted to get you there. Guess that’s about it for now. Enjoy the rainy, but warm, week. Still kind of wet and cold to do much planting. 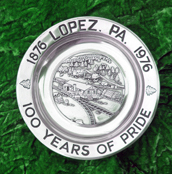 Have news, call me at 570-928-9238; mail me; see me; or e-mail me at news@lopezpa.com I’ll get it in for you. I’ll be here next time and thanks for reading.